Donatella Di Cesare teaches Theoretical Philosophy at Sapienza University in Rome. She is among the leading voices in the contemporary scene of Italian philosophy. Very present in the public debate, both within academia and on the media, she collaborates with national and international newspapers, magazines and journals. She is member of the Italian Council for Refugees (UNHCR–ONU). Among her recent books: Heidegger and the Jews. The Black Notebooks (Polity Press, 2018); Torture (Polity Press, 2018); Terror and Modernity (Polity Press, forthcoming 10 May 2019); Resident Foreigners: A Philosophy of Migration (Polity Press, forthcoming 20 September 2019). For this latter book she was awarded the prestigious Pozzale-prize and the Sila-prize for nonfiction. Virag Molnar received her Ph.D. from Princeton University and is Associate Professor of Sociology at the New School for Social Research. Her research explores the intersections of culture, politics, and social change in Eastern Europe, with special focus on urban and material culture. She has written about the politics of architecture in socialist and postsocialist Eastern Europe, the post-1989 reconstruction of Berlin, and the new housing landscape of postsocialist cities. Current work focuses on the cultural production of nationalist populism in Hungary. Her book Building the State: Architecture, Politics, and State Formation in Postwar Central Europe (Routledge, 2013) received the Mary Douglas Prize from the American Sociological Association. She has been a visiting fellow at the Minda de Gunzburg Center for European Studies at Harvard University, the Humboldt Universität in Berlin, and the American Academy in Berlin. Her research has been supported by the National Science Foundation and the American Council of Learned Societies, among others. Cas Mudde is the Stanley Wade Shelton UGAF Professor in the School of Public and International Affairs of the University of Georgia and Professor II at the Center for Research on Extremism at the University of Oslo. His research aims to answer the question: how can liberal democracies defend themselves against political challengers without undermining their own core values? 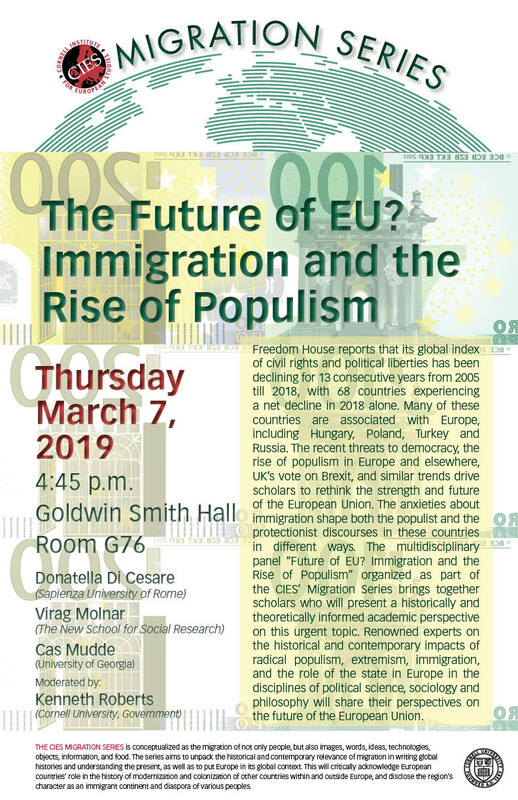 His recent publications include The Far Right Today(Polity, Fall 2019), The Far Right in America (Routledge, 2018), Populism: A Very Short Introduction (Oxford University Press, 2017), The Populist Radical Right: A Reader (Routledge, 2017), SYRIZA: The Failure of the Populist Promise (Palgrave Macmillan, 2017), and On Extremism and Democracy in Europe (Routledge, 2016). He is a columnist for the Guardian US.